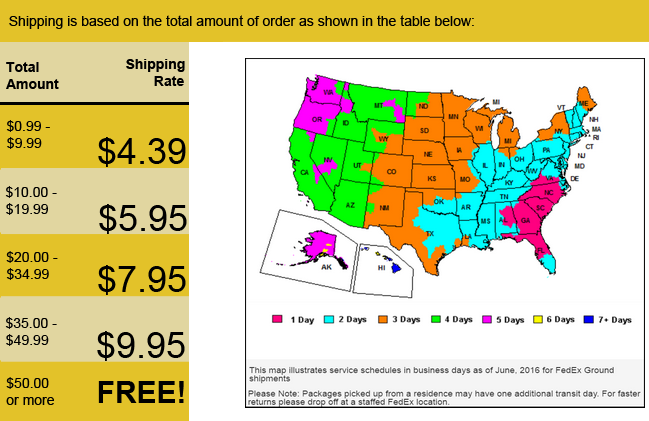 We will ship your items anywhere in the continental US (48 States) prepaid. – unless otherwise noted. All orders are usually shipped within 2-5 business days. You will be notified by E-Mail if there will be a delay. We use FedEx or USPS – you will receive a tracking number as soon as the item has been sent to you. If your shipping address is in Alaska, Hawaii or Puerto Rico please email us about shipping rates. ** We are currently able to send some shipments to Canada and other Overseas destinations. We would love to give you a custom quotation for shipping there. Please contact us with item name and full shipping address and we will let you know the additional cost. Additional shipping charges will apply to the following locations for shipments by a Common Carrier Truck Line. Please let us know in advance if you live in the locations below so we can get a shipping quote with a suitable carrier. If your order does incur additional shipping fees, any returns will also incur additional fees. Additional charges will not apply to smaller items that ship USPS. We want you to be satisfied with the items you receive from us. If, however, you are not satisfied, you may return your purchase to us for a refund. * You must return the item to us in the original packing within 30 days and it must not be damaged in any way. * There may be a 20% re-stocking fee. Why can we not pay shipping on returns? Most of our shipments go out for far less than what we pay to get it to you. We cover the cost for you! So when coming back, we ask that you help by bearing the return cost. Thanks in advance for your understanding on this issue. We add extra packing to most of our items prior to shipping to assure their safe arrival to you. These are quality items and you do not want them arriving damaged. If your item has obvious damage in shipment refuse to accept it from the carrier. You must notify us immediately. All damage claims MUST be reported in writing within 48 hours of delivery or claims will not be processed. Failure to contact us could limit our ability to seek damages from the shipper and the replacement of your item. We add extra packing to most of our items prior to shipping to assure their safe arrival to you. These are quality items and you do not want them arriving damaged. If your item has obvious damage in shipment refuse to accept it from the carrier. You must notify us immediately. Some of our products may be shipped in kit form or partially assembled. Kits will be shipped with all necessary parts, and can be assembled with easy to follow instructions. Paint, decals, glue, etc are usually not included. This is to allow you to customize your kit to your own tastes and needs. Most items require delivery via common carrier due to the size of the products, which means a truck freight company, will be delivering this item. To provide a higher level of service the shipper will work with you directly to arrange for a time and date of delivery. The common carrier drivers will bring your purchase to your delivery address for curbside delivery. The driver will not bring the shipment into your home or up any stairs. Drivers are expected to notify you of a delivery time and day and your delivery service options, so you can have the appropriate help available to get purchases into your home if necessary. Please keep in mind that you may need a couple of people to help unload it depending on the level of delivery service. Alternatively, most truck freight companies offer additional services to help you move items from the truck into your house if it is not included in your shipping charges. You can work with the shipper directly to arrange for any additional delivery services that you would like to take advantage of. You will be responsible for directly paying the truck freight carrier for these additional services. Note: The freight company will charge an additional $75.00 (in some cases $100) if the delivery of any large item is to a residence.